Choose your own parking space, park your own car and keep your keys. Relax in the airport knowing that while you're away your car will stay exactly where you left it. Incredible convenience you cannot get any closer. This is walking distance and only 1-4 minutes depending on where you find a space and park up. To get to the terminal check in desks, you can take a short 5 minute transfer, or you can walk there which takes 10 - 12 mins. With all of the security features you'd expect from a quality on-airport car park, you'll be relaxed and stress free when you depart. 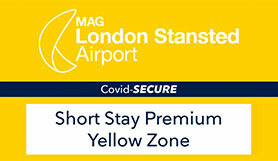 CCTV, Number plate recognition barrier system (ANPR), flood lighting and regular patrols are some of the security elements you expect from Stansted Airport. If you're going on a short business trip, a short break with your loved one, family, friends or just on your own, you can be sure to kick off the trip without any hassle when parking in a premium short stay car park. It couldn't be easier... Park up, keep your keys and take the short stroll into the check-in area in the terminal. Please take proof of purchase with you on your day of travel.